Flow Chart Recipes – Crazy or Cool? I have a habit of copying all the recipes that I come across into this format. Above is my recipe for enchiladas, which are quite delicious. As you can see, the ingredients are listed out in a typical fashion, but instead of a list of steps for making the food following the ingredients, I connect everything with lines and write out the steps in boxes along the lines. So, starting from the top, a typical recipe might read: 1) Heat the olive oil in a pan over medium-high heat. 2) Cook onion until soft. 3) Add garlic; cook until fragrant … and so on. I’m not sure where I picked this up. I never really cooked much from cookbooks, I only ever really did what my mom and grandma told me to do in the kitchen. Of course, I can read a typical recipe; that is, after all, how everyone else on the planet writes them. But if I copy a recipe from the computer to make in the kitchen, I always copy it down like this. I’m not sure that it’s a more effective way of communicating a recipe or not. I think that in some respects, it works better logically. For example, I know that (a little over halfway down the page) the onion, garlic, chili powder and cumin are all involved in the same step, so I can get those together into a little bowl, then dump them in with the ground beef. In typical notation, I would have to read that step, then look up to the ingredients list to prepare it, then go back down and find where I was in the recipe. It’s a lot of going back and forth between the list of steps and the list of ingredients, which can be confusing in more complex recipes. I think cooking should be really fun and personal, so if you found something you like, stick with it. 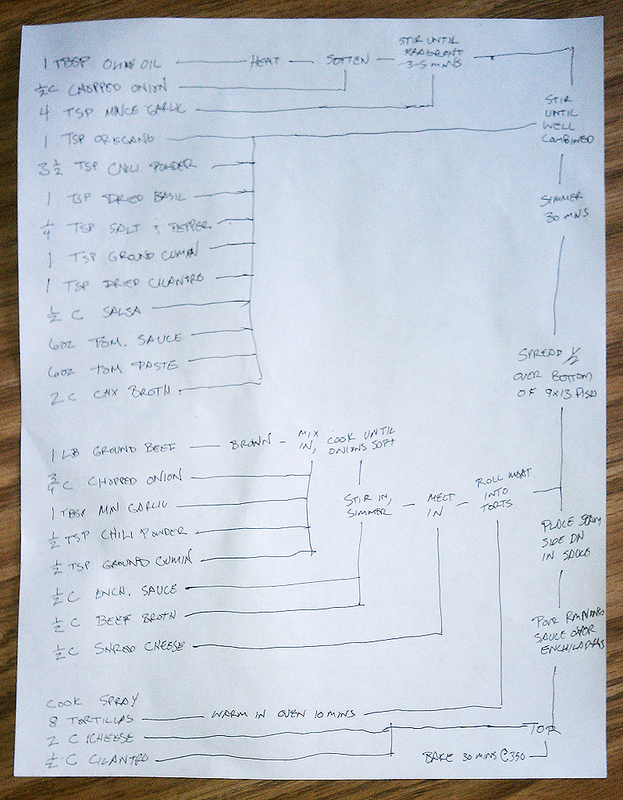 Just know that if I ever make a cookbook, it’s going to be in flowchart notation. This entry was posted in Personal and tagged Cooking, Process. Bookmark the permalink. This has definite potential. Find a way for me to work in the infinite substitutions I make and I’m sold.